Street craps – played with two dice on a sidewalk - is little like its casino brother. The odds are different, the pace is much faster, and your dealer is typically a hustler or worse, a psychopath. As for me, I learned how to deal street craps in prison. As a psychiatrist I’ve evaluated competency and treated mental illness among prisoners, some of whom were hustlers or psychopaths. Street hustlers in my experience are usually quite engaging and reflective, able to gain insights and do productive psychological work. Psychopaths are cold and heartless – mimicking the emotions and social styles they have seen expressed by others. Typically psychopaths don’t see a psychiatrist voluntarily, and when they do, they spend a good deal of time looking for angles – how to game the system and get what they want from the doctor. When a psychopath offered to teach me street craps in a prison, I knew from my clinical training that he was being friendly only because he wanted something from me - information, medications (some medications are used as currency in prisons), or to learn some therapeutic tricks he could use on others. Nonetheless I was riveted as he explicitly taught me how to spin the dice to get the numbers I wanted and how to tap and blow on them to distract unsuspecting clients. At the same time, I told myself, I was gaining valuable insight into the mind of a psychopath. After the tutorial -- and alas too late to do anything about it -- I realized to my horror that my pen was missing. He wasn’t interested in passing time with some friendly banter or in gaining some psychological insights while he was teaching me how to roll the dice – the dice lesson was for distracting me while he swiped my pen. There are occasional press reports and academic articles that speculate that psychopaths – essentially, those who do not feel empathy – have higher investment returns and climb higher in the Wall Street hierarchy. Books such as Snakes in Suits and The Wisdom of Psychopaths, and articles like this Stanford University study reinforce that perception. There are some limitations in these books and studies, but the basic premise is accurate - psychopaths do not process information about risk as others do, and they do not dwell in emotional ruts or have moral qualms. In the markets, unlike in street craps, you may be playing against investing psychopaths, or computers trained to trade like psychopaths, without realizing it. If you’re going to swim with sharks, better to be one. And it is true that a predatory mindset suits hedge fund managers well. They are rewarded for their curiosity about any advantage they can find, regardless of who is on the other side of the trade. I know of two very human hedge fund managers who prominently display large images of sharks in their trading rooms. Sharks are aggressive and ruthless, and presumably traders perform better when reminded to think like sharks. At the same time, sharks have a lot in common with psychopaths. In particular, sharks don’t get hung up about morality, they are quick and aggressive, they don’t feel regret or wistful nostalgia, and they don’t second-guess themselves. But there is clear limit to the social virtues of shark-like thinking. Remember “Grandma Millie,” the fictional California grandmother who Enron traders ridiculed because she couldn’t pay her power bills in 2000? Or when Wall Street was insolvent in 2008-2009 due to the excesses of shark-ish thinking at Bear, Lehman, AIG, etc... Currently the only cage for sharks on Wall Street are weak legal boundaries and the annual bonus, which restrains risk-taking to an annual cycle of risk-reward. In order to improve Wall Street’s stability a five-year bonus cycle with claw-backs in case of spectacular risk-taking failures. And we need stiff punishments for financial crimes. In prison I was shocked to see prisoners with life sentences for a series of small property thefts that didn’t hurt anyone and whose stolen property value was less than $10,000. Yet traders who bankrupt banks serve no prison time and leave with prior years’ bonuses in their bank accounts. Traders need to be incentivized to think of the long-term, and take appropriate risks within those parameters. Traders are sharks, and if we don’t cage them properly, then we shouldn’t be surprised about the damage they cause. Over the next few weeks our newsletters will explore the traits of sharks we should seek to emulate in investing, as well as those – more obvious - to avoid. The letter also explores why these traits can be so lucrative by examining one of the most repetitive market patterns – momentum – which is driving the market’s recent highs (sadly, without most investors participating). We go on to explore research detailing the stickiness of emotions and slumps and how they prevent us from pivoting rapidly, and we conclude with a discussion of tools and techniques to bring the positive traits of a shark into our own investment decision making. As you may know, Google released negative earnings news on Thursday. The stock promptly lost 10% of its value, and many investors were left wondering what to do. Well, with news analytics technology, we now have a (short-term) answer. In this case, they should have sold Google in the short term. The following chart was prepared by Jacob Sisk, Lead Research Scientist at Thomson Reuters. 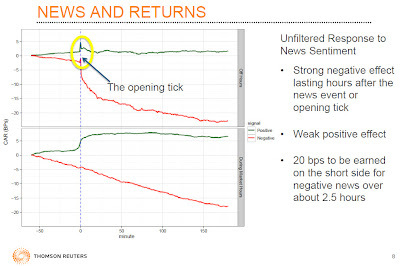 This was presented on Wednesday at the Thomson Reuters News Roundtable in New York. The Roundtable is a fantastic event with authentic discussions of the real-life challenges to implementing sentiment based strategies. I will alert readers in advance next time it is held. Image Courtesy of Jacob Sisk at Thomson Reuters. As you can see in this chart, there is a persistent decline in stocks hours following bad news. 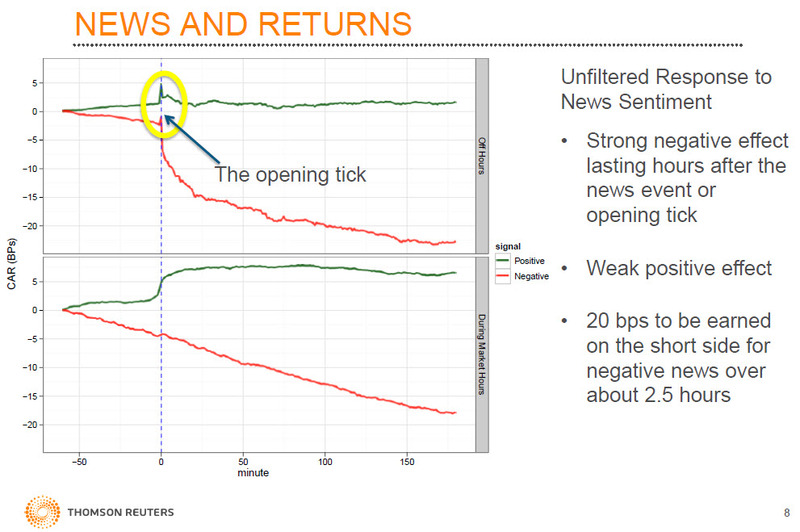 This excess returns scale with the negativity of the news, leading to 40bps (0.4%) additional declines for negative news in the top 95% of negativity. We saw something similar with Google (GOOG) on Friday. 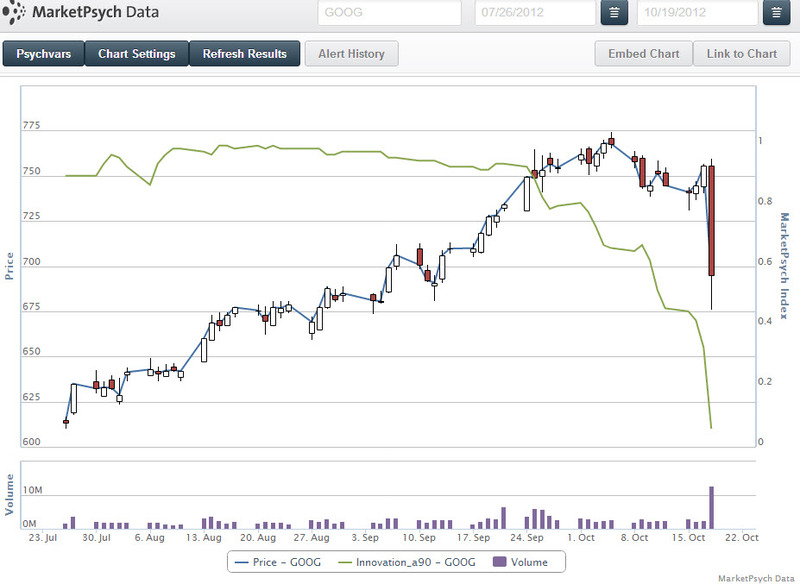 From Friday’s opening price, GOOG dropped 100bps more than the Nasdaq100 in the subsequent 2.5 hours after the open. For longer term investors we see evidence that fundamentally bad news, as we saw with Google, leads to persistent declines over longer periods as well. (Our old fund’s trading signals were triggered by Google’s bad news and had a five day short signal from the Open Friday morning). So how would a shark have behaved? A shark would not linger and wonder what to do, essentially under-reacting to the bad news. A shark would sell immediately and ask questions later. And that is what news trading algorithms were doing as well. If you’re going to swim with sharks, it’s important to think and act like a shark. After this problem at Google, I went back and looked at our perceptual data to see if investors in online social media may have identified problems at Google. Interestingly, the level of Innovation Perceptions about Google plummeted dramatically in the month before the earnings release. 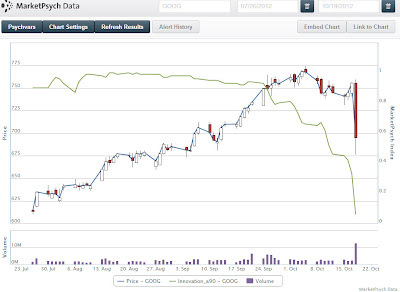 See the following image, where the green line is the average of innovation perceptions (discussions about innovativeness at Google) in online social media, and the candlestick line is the GOOG stock price. Despite the enormous rally in the stock price over the past 3 months, online investors perceived a decrease in innovativeness at Google. We saw a similar disparity before the decline of Netflix stock began. The decline in Netflix was preceeded by a decline in innovation perceptions about that company. That said, I think Google is an amazing company and nothing like Netflix on a fundamental level. Google is a bellwether for innovation, despite the current setbacks. Nonetheless, herd perceptions drive stock prices in the short to medium term, despite a strong long-term fundamental outlook. It has been a busy few weeks as we launch the Thomson Reuters MarketPsych Indices for monitoring market psychology. In the next month we will be speaking in New York, attending the Sentiment Analysis Symposium in San Francsico, and our Chief Data Scientist, Aleksander Fafula, is speaking at Predictive Analytics World in London. Regarding past and current forecasts based on sentiment trending positive: we no longer believe an Israeli attack on Iran is likely (Netanyahu faces too much opposition within Israel), we believe the housing recovery will generally continue in the U.S., the fiscal cliff will be resolved with lots of tension but not much change to deficit spending, and equity prices will be higher in 6 months. We hope you found the letter this week interesting and useful! Our newsletter will be moving to a weekly schedule, every Saturday, and will incorporate actual forecasts over the next few weeks as our macro-economic prediction software comes online.